Updates and bug fixes to RTTOV v12 will be published here. Please report any bugs you find in RTTOV using the NWP SAF Helpdesk. The official release packages for each version don’t contain the bug fixes or updates listed here under that version so you should apply any fixes provided below. Bugs in earlier versions have been fixed in later versions. Show/Hide the table of known bugs and other updates in RTTOV v12.3. 16/04/2019 Bug - fixed Affects: solar simulations (excluding MFASIS simulations) for multiple profiles where some, but not all, profiles have solar zenith angles above 85.3 degrees (the maximum for which RTTOV can compute solar radiation). There is no problem if all profiles passed to RTTOV have solar zenith angles which exceed this limit or if all profiles have solar zenith angles below this limit. Issue: this particular case is not checked during the local satellite/solar path geometry calculations and a numerical error results. For profiles with large solar zenith angles above the limit RTTOV should return zero radiances. Fix: download this tarball, extract it in the src/main/ directory, and recompile RTTOV (a clean compilation is not necessary). This fix can be applied to RTTOV v12.2 as well. 16/04/2019 Bug - fixed Affects: VIS/IR cloud simulations with the simple cloud overlap option (cldstr_simple) and the new grid_box_avg_cloud option both true (v12.3 only). NB The simple cloud overlap option generates one clear and one cloudy column with a single effective cloud fraction computed as the maximum cfrac value in the layers from the top of atmosphere down to the pressure specified in the cldstr_low_cloud_top option. It is intended for use in very specific scenarios and in the general case it can have a very detrimental effect on the accuracy of simulations. It is therefore not recommended unless you really know what you are doing. This bug does not affect simulations using the default maximum/random cloud overlap so the vast majority of users will be unaffected. Issue: when the grid_box_avg_cloud option is true the input grid-box-layer-average cloud concentrations are divided by the cloud fraction inside RTTOV to obtain the cloud concentration of the cloudy fraction of each layer. The code always divided the cloud concentrations by the corresponding layer cfrac which is correct for the maximum/random overlap scheme. However, for the simple overlap scheme the cloud concentrations should be divided by the calculated effective profile cloud fraction instead. Fix: download this tarball, extract it in the src/main/ directory, and recompile RTTOV (a clean compilation is not necessary). 04/04/2019 Bugs - fixed Affects: HTFRTC Jacobian model (v12.3 only). - The emissivity Jacobians are output in emissivity_k%emis_out instead of emissivity_k%emis_in, the latter being consistent with RTTOV. Fix: download this file to src/main/ and recompile RTTOV (a clean compilation is not necessary). 01/04/2019 Bug - fixed Affects: new Baran 2018 ice optical property parameterisation (v12.3 only). Issue: a bug in the code means that the optical property parameterisation is not implemented correctly. The impact can be quite variable, but is especially large for visible/near-IR channels. This bug does not affect the pre-existing Baran 2014 parameterisation. Fix: download this tarball, extract it in the src/main/ directory, and recompile RTTOV (a clean compilation is not necessary). This bug fix affects the output from the test_rttov12_hires.sh and test_multi_instrument.sh test scripts. Updated test reference data are available: download this tarball and extract it in the rttov_test/ directory. Show/Hide the table of known bugs and updates for RTTOV v12.2 which have been fixed/implemented in RTTOV v12.3. Bugs listed above may also affect v12.2. Issue: there was an error in the calculation of geopotential height which is used when calculating the local path angle through the atmosphere. There is no impact for nadir simulations, and the errors increase to order 0.1K at zenith angles of 60 degrees (though in many channels the errors are smaller than this). Fix: download and extract this file in your top level RTTOV v12.2 directory (e.g. ~/rttov12/) and recompile RTTOV. NB This tarball includes the HTFRTC bug fix and optional update dated 09/05/2018 below. Updated reference data for the test_htfrtc.sh script can be extracted in rttov_test/. Output from the example_htfrtc_fwd.F90 example program does not change as a result of this update. Issue: minor problem with incorrect wavenumbers displayed in status bar in the display of Jacobians. Fix: download this file and extract it in the gui/ directory in the top-level of your RTTOV installation and re-run the GUI. NB This includes the fixes below dated 25/01/2019 and 11/01/2019. 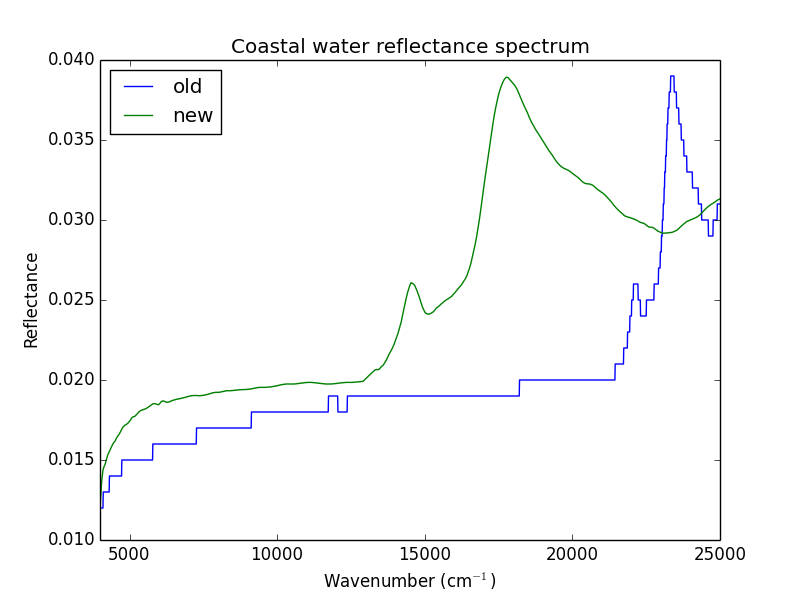 Issue: with recent versions of matplotlib, labels were incorrect on the y-axis in the kmatrix / kpcmatrix views, and the number of PC scores was incorrectly set in kpcmatrix. Fix: this bug is fixed in the code update available above dated 30/01/2019. Issue: there is a mis-match in the wavelength/wavenumber displayed in the status bar of the Radiance window. 30/10/2018 Bug - fixed Affects: MFASIS simulations. Issue: the MFASIS parameterisation as originally implemented gave larger-than-expected errors for mixed-phase cloud. The model has been revised to improve the accuracy in these cases. Fix: download and extract this file in your top level RTTOV v12.2 directory (e.g. ~/rttov12/) and recompile RTTOV. The tarball includes updated reference data for the example_cld_mfasis_fwd.F90 example program. This code update should be used in conjunction with the new MFASIS LUT files now available on the coefficients download page. Issue: there are errors in generated Mietable files if more than one particle type uses the ARTS database of optical properties. This does not affect the Mietable files available to download on the coefficients download page because they only use the ARTS database for one particle type. It only affects the code which generates the Mietable files, it does not affect RTTOV-SCATT itself. Fix: download this file to src/mw_scatt_coef/ and recompile RTTOV. 01/08/2018 Bug - fixed Affects: reading HDF5 PC-RTTOV coefficients using rttov_read_coefs with the optional channels_rec argument. Issue: the channels_rec argument to rttov_read_coefs is ignored for pccoef files unless the channels argument is also passed. This is not consistent with ASCII and binary format files for which the two arguments are independent. Fix: download this file, extract to src/coef_io/ and recompile RTTOV. Note that after this update the reconstructed radiance channels will be numbered from 1...n if you supply the channels_rec argument, regardless of whether you pass the channels argument: this is the intended behaviour and is consistent with the user guide. 12/07/2018 Bug - fixed Affects: secondary radiance output radiance2%down(:,:) when the do_lambertian option is true. Description: the downwelling radiances are not modified with the Lambertian correction and so are inconsistent with the other radiance and radiance2 outputs. Fix: download this file to src/main/ and recompile RTTOV. 30/05/2018 Bug - fixed Affects: non-solar IR cloud/aerosol simulations. Most likely to affect code where the coefficients structure variable (type rttov_coefs) is allocated dynamically at run-time. Description: some potentially uninitialised values in the cloud/aerosol optical properties structure cause intermittent/occasional segmentation faults when they are used to size arrays later on inside RTTOV. Fix: download this file to src/coef_io/ and recompile RTTOV. Note that this will not work with RTTOV v12.1: see the table below for the v12.1 fix. 10/05/2018 Optional update Affects: output warnings when apply_reg_limits is true. Description: in v12.1 and earlier, no warnings are printed out when input profiles exceed the regression limits if the apply_reg_limits option is true. In v12.2 warnings are printed out regardless of apply_reg_limits. This update reverts to previous the behaviour. Update: download this file to src/main/ and recompile RTTOV. Description: since the RTTOV v12.2 release, updated Mietable files were made available for download (see the coefficients download page). These result in changes to the test outputs for the test_rttovscatt.sh and run_example_rttovscatt_fwd.sh scripts which now differ to the test reference data included in the v12.2 package. Update: download and extract this file in the rttov_test/ directory. This will enable you to verify RTTOV-SCATT in your RTTOV installation using the latest Mietable files. Description: in the v12.2 release, HTFRTC cannot be run via the RTTOV parallel interface. This update enables the capability for multi-threaded HTFRTC simulations using OpenMP. Update: this update is included in the HTFRTC bug fix dated 14/02/2019 above. When compiling you must specify one of the *-openmp compiler flag files in build/arch/ to enable multi-threaded simulations. The update tarball includes the modified example code and associated calling script (src/test/example_htfrtc_fwd.F90 and rttov_test/run_example_htfrtc_fwd.sh) which demonstrates use of the RTTOV parallel interface. Description: due to a bug in the calculation of geopotential height (used in the calculation of local path angles through the atmosphere) there are small errors in the HTFRTC outputs equivalent to up ~1mK in reconstructed brightness temperatures. In addition the rttov_read_coefs_htfrtc.F90 subroutine has been updated to improve compiler compatibility (this has no impact on outputs). Fix: the fix for this is included in the HTFRTC bug fix dated 14/02/2019 above. The fix changes forward model outputs slightly (equivalent to up to ~1mK in reconstructed brightness temperatures), and also has a small impact on Jacobians. Updated test reference data are available under the 14/02/2019 bug fix above. Show/Hide the table of known bugs and updates for RTTOV v12.1 which have been fixed/implemented in RTTOV v12.2. Bugs listed above may also affect v12.1. Fix: download this file and extract it in the gui/ directory in the top-level of your RTTOV installation and re-run the GUI. NB This includes the fixes below dated 25/01/2019 and 14/01/2019. Issue: there was an issue with the location in which the GUI was looking for icons for the interface. This can cause the GUI to fail to operate correctly, for example, when running K model simulations. Issue: some potentially uninitialised values in the cloud/aerosol optical properties structure cause intermittent/occasional segmentation faults when they are used to size arrays later on inside RTTOV. Fix: download the file rttov_nullify_coef_scatt_ir.F90.v12.1 to src/coef_io/, rename it to rttov_nullify_coef_scatt_ir.F90, and recompile RTTOV. Note there is a different fix for RTTOV v12.2 (see table above). 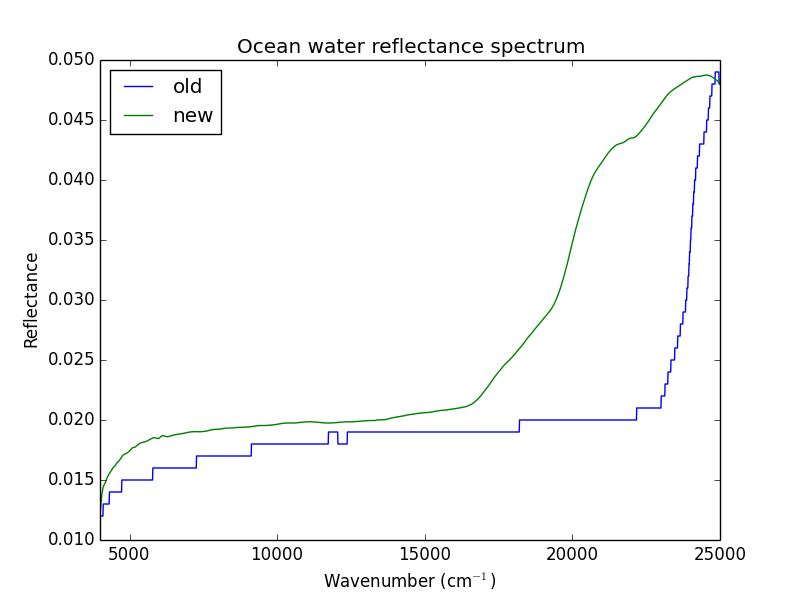 For the ocean water case the largest impact on top-of-atmosphere simulated reflectances is up to order 0.01 in channels around 0.4-0.55µm while for other channels the impact is of order 0.001. A code fix is available: copy this updated source file to src/main/ and recompile RTTOV. This update changes the test output for test_fwd.sh, test_rttov12.sh, test_solar.sh and test_brdf_atlas.sh. If you wish to update the reference data for these test scripts download and extract this tarball in the rttov_test/ directory. 11/08/2017 Bug - fixed Minor bug in pyrttov (the Python RTTOV wrapper) which causes a fatal error if the Atlas class is initialised with the verbose argument set to False. 11/08/2017 Bug - fixed Array bounds errors occur with the BRDF atlas if the latitude is set to exactly -90 degrees or if the longitude is set to exactly 180 degrees. A code fix is available: copy this updated source file to src/brdf_atlas/ and recompile RTTOV. 07/07/2017 Bug - fixed Array bounds errors occur with the CAMEL atlas if the latitude is set to exactly -90 degrees or if the surface type is set to land and the atlas has no data for the given lat/lon. A code fix is available: copy this updated source file to src/emis_atlas/ and recompile RTTOV. 07/07/2017 Bug - fixed An array bounds error occurs with the UWIRemis atlas if the latitude is set to exactly -90 degrees. 08/06/2017 Bug - fixed An array bounds error occurs if the TELSEM2 atlas is called for a profile with a latitude of exactly 90 degrees. A code fix is available: copy this updated source file to src/emis_atlas/ and recompile RTTOV (NB this includes the bug fix below dated 27/02/2017). 17/03/2017 Bug - fixed If you carry out visible/IR aerosol simulations using the predefined particle types and you do not use the RTTOV interpolator (i.e. profiles are input on coefficient levels) then the relative humidity calculation is not carried out. This will result in errors in the calculation of optical properties of those aerosol types which vary with humidity. There is no problem if you are using the RTTOV interpolator. A code fix is available: extract the file rttov121_bugfix_20170317_aerosol.tar.gz in the src/main/ directory and recompile RTTOV. 27/02/2017 Bug - fixed The TELSEM2 emissivity atlas returns emissivity values slightly greater than one for some locations with climatological sea ice for channels at 85GHz and greater. If these values are passed directly into RTTOV v12, it will fail with an error saying there are invalid emissivity values. This can be avoided either by explicitly capping the emissivities from the atlas at 1. in your own code (e.g. "emis = MIN(1., emis)") or by downloading this updated source file to src/emis_atlas/ and recompiling RTTOV (NB this includes the bug fix above dated 08/06/2017).